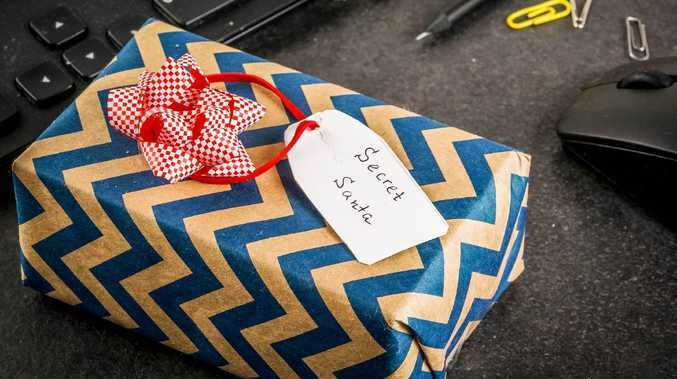 The whole point of Secret Santa is that the giver usually stays secret. But not in this case where a woman not only finds out who gave her the present, but also tells them she wants better. A Reddit user has revealed just how wrong an office present swap can go. He explains he purchased a colleague a box of chocolates and blanket in the workplace Secret Santa, which had a budget of $50. But the recipient wasn't happy with the choices. He shares a string of text messages showing a woman thanking him for the present, but then making a very forward request. "So … I know this is kinda awkward … but the spending limit was $50 and I looked online and it seems that the blanket and chocolates only add up to about $30? Do you think it's possible you could get me something else? My kids have been spending me up the wazoo! LOL" she writes in the message. 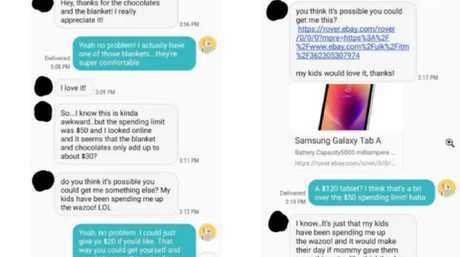 He offers to pay her $20 to make up the difference, but she says she would prefer another gift, and sends a link to a $120 tablet. "My kids would love it, thanks," she finishes off the strange demand. When the gifter says it is "a bit over" the spending limit, the woman replies, "you're an engineer and make quite a bit more than I do". The woman opens the exchange with gratitude before suggesting a new gift. Source: Reddit. She suggests, alternatively, that $120 in cash is also acceptable. When the Reddit user says spending $120 on a co-worker is out of his budget she replies, you're "kidding me right? You don't even have kids. What else would you spend your money on?" 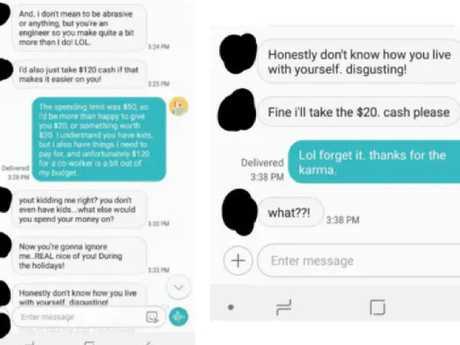 The woman continues the insults, calling her colleague "disgusting" before later saying she'll take the original $20 cash offer. But that offer was now gone, "forget it", the man finishes the conversation. Understandably. 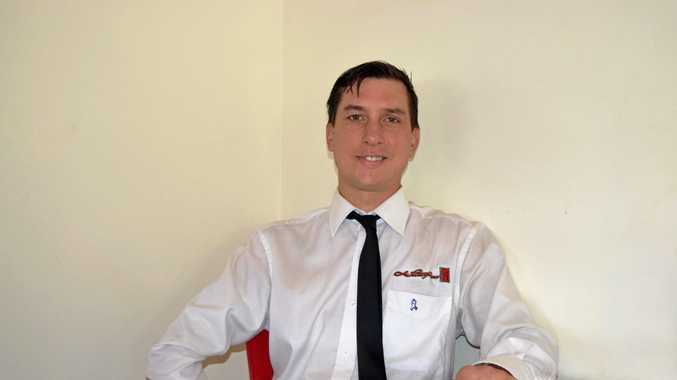 This article originally appeared on Kidspot and was republished with permission.